Originally constructed in 1855, 111 Noble Street is a two-story wood frame house located within the Greenpoint Historic District. Although it underwent a series of changes throughout the 20th century, the alterations primarily consist of superficial modifications to its façade and front porch. Original window and door openings remain, and no visible additions have been constructed. 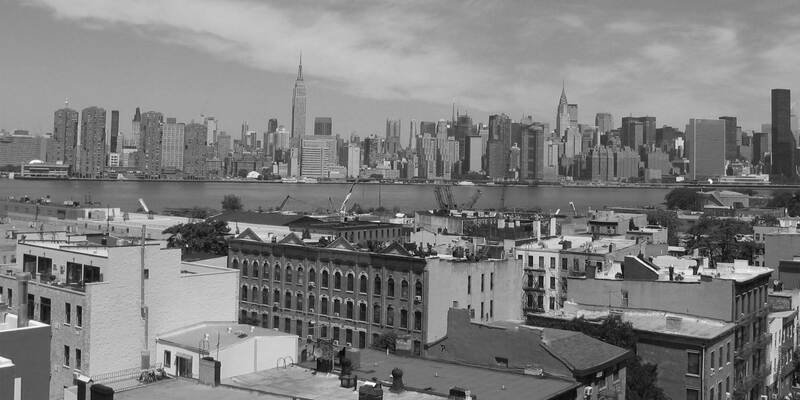 The Greenpoint neighborhood in Brooklyn with Manhattan in the background. Photo: Wikimedia Commons, Kgwo1972. The proposed demolition is premised on an interpretation of the building as a non-contributing property within the Greenpoint Historic District, as well as concerns about its structural integrity and lack of potential for rehabilitation. However, there is no such contributing or non-contributing assignation in the 1982 Greenpoint Historic District Designation report contrary to the owner’s assertion. Additionally, the basic form of the building is apparent, and it remains a viable candidate for restoration. Look no further than 105 Noble Street for an example of a vinyl-shrouded ugly duckling, transformed into a beautiful clapboard swan. The MAS Preservation Committee recognizes that 111 Noble Street, in its current form, is certainly limited in its representation of the character of the Greenpoint Historic District. However, its demolition would establish a concerning precedent regarding the future of a large number of similarly altered buildings. There are several wood-frame structures within the district that exist in a similar state of repair and which have also experienced alterations to their façades and siding, including several on Noble Street alone. Allowing the demolition of 111 Noble Street would risk establishing a standard wherein any number of designated buildings in disrepair could be viewed as potential redevelopment sites, and could result in the loss of many more historic buildings within the district and beyond. Finally, any alterations to 111 Noble Street should be contextual if not restorative. Although the proposed building makes use of simple materials and respects the cornice line of the adjacent building, it has no relationship to the surrounding block or district. Thus we respectfully ask the Landmarks Preservation Commission to work with the applicant to find a preservation solution for 111 Noble Street.